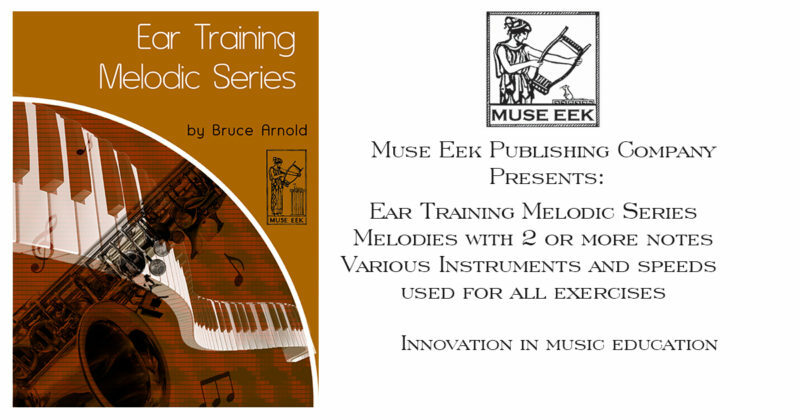 The Melodic Ear Training Series is recommended for students with above 80% skills with one note ear training. There are many different products you can buy that vary in difficulty. Having around 80% right notes with the “one note” exercise found in these books would help you be more productive with the Melodic Ear Training Series. Having Troubles with Melodic Ear Training? Ear Training Two Note Melodic is the first in a series of ear training products that train a student to identify a series of individual notes heard in succession. This download concentrates on two consecutive pitches. There are three levels of difficulty in this series. As you move through each level you will find that the key center cadence is of shorter duration therefore requiring a better key retention, and the pitches are played faster, which requires quicker recognition of a pitch’s relationship to a key center. There are three levels to the two notes series: Beginning, Intermediate and Advanced. The Ear Training Two Note Melodic for Piano Ear Trainingonly has melodic combinations within one octave. This will help the beginning student to gain ability with melodic examples. As you progress to the 2 Note with other instruments besides piano, you will find the melodies are within two octaves, which is much harder. The recognition of the pitches found in these two notes examples should be based on their relationship to a key center and not their relationship to either a melody or the distance between each pitch i.e. “an interval”. This is an important distinction that has been pointed out numerous times in the books Ear Training One Note Complete, Contextual Ear Training and Fanatic’s Guide to Sight Singing and Ear Training. Once you grasp this distinction, –and do not use this series before you do –these exercises will greatly increase your ear training skills by having you identify multiple pitches as they are played in succession. This download contains all 792 MP3s found in the Beginning, Intermediate and Advanced Ear Training Two Note Melodic for Piano. Each level contains a series of 264 MP3s, each with a cadence and then two pitches in succession. 132 MP3s of these files start with a Major Key cadence and 132 MP3s with a minor key cadence. This collection covers all melodic possibilities within one octave. Below is samples in both the Major and Minor Key Centers from each of the three levels of the Ear Training Two Note Melodic for Piano Ear Training. You can hear more examples under the individual downloads below. Get Ear Training Two Note Melodic for Piano Ear Training Bundle download today! We have also found over the years that many customers may prefer an incremental approach to getting involved with this ear training method. To satisfy this we have broken the Ear Training Two Note Melodic for Piano downloads up so you can purchase them as three separate volumes. While not the most cost effective way to approach this ear training, we include it for the aforementioned reasons. Below is three samples in both Major and Minor Key Centers from the Ear Training Two Note Melodic Beginning Level for Piano. Get Ear Training Two Note Melodic Beginning for Piano download today! Below is three samples in both Major and Minor Key Centers from the Ear Training Two Note Melodic Intermediate Level for Piano. Get Ear Training Two Note Melodic Intermediate for Piano download today! Below is three samples in both Major and Minor Key Centers from the Ear Training Two Note Melodic Advanced Level for Piano. Ear Training Two Note Melodic Advanced for Piano download today! The Two Note Melodic in a Major Key with Seven Instrument Bundle differs from the Ear Training Two Note Melodic for Piano because of its difficulty and different organization. Melodies found in Two Note Melodic in a Major Key with the Seven Instruments are based on two octaves rather than one making them substantially harder. There are seven instruments covered in this series and the level gets more difficult as you move through the 7 melodic courses. In each level the cadence is of shorter duration and the two notes are played faster. This bundle download contains all the audio files for all seven instruments found in the 2 Note Melodic Ear Training Series. You will find that you will save over 40% by purchasing the bundle. Please note that the 2 Note Melodic Ear Training for Piano in considered a separate package because of its different organization. If you prefer to purchase individual instruments please see: Two Note Melodic Ear Training. The downloads found in this bundle are recommended if you are getting 80% correct using the Advanced examples from the Ear Training One Note Complete Book. All Two Note Melodic exercises contain a major cadence on piano followed by two consecutive pitches played by one of the seven instruments listed below. Then after a pause you will hear the note names of the two notes. This melodic series with different instruments is graduated in its level of difficulty. As the level gets harder, the cadence is played more quickly as are the two notes. All melodic possibilities within two octaves both ascending and descending. 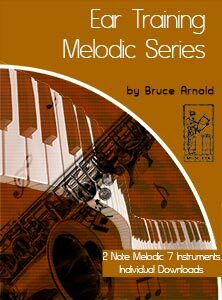 The Two Note Melodic in a Major Key with Seven Instrument Bundle contains 4020 MP3s which cover all melodic possibilities within two octaves both ascending and descending on the seven instruments listed above. These files differ from the 2 Note Melodic for Piano download. The 2 Note Melodic for Piano only has melodic combinations within one octave. Since these seven downloads get progressive harder it is recommended that you start with the Tenor Sax and work you up to Acoustic Bass. Many times the sound of an instrument can effect a person’s ability to hear melodies within a key center. This is caused by our propensity to learn things contextually. In other words when the instrument changes our ability to identify pitches within a key center can be affected. This will vary from one person to the next. Please use the examples found on this page to gauge if you need to work with these downloads. This bundle of all the 2 Note Melodic Ear Training files does not contain a book. It is recommended that you first work with the Ear Training One Note Complete Book so that you can fully understand this method ear training method before attempting the Two Note Melodic Series. Please note: You use the same technique as you did with the Ear Training One Note. i.e. you identify the sound of each pitch within the key center. Below is an example from each of the 7 instruments found in the Two Note Melodic in a Major Key with Seven Instrument Bundle. With each instrument you get progressively faster. You can find more examples under the individual downloads below. Get Two Note Melodic in a Major Key with Seven Instrument Bundle Download Today! We have also found over the years that for many reasons customers may prefer an incremental approach to getting involved with this ear training method. To satisfy this we have broken the Ear Training Two Note Melodic in a Major Key with Individual Instruments Bundle downloads up so you can purchase them as seven separate volumes. While not the most cost effective way to approach this ear training we include it never the less. This page contains downloads for 7 different instruments. If you would prefer to purchase a bundle of all seven instruments please see: Two Note Melodic Bundle. All of these downloads are recommended if you are getting 80% correct using the Advanced examples from the Ear Training One Note Complete Book. The Two Note Melodic exercise contains a major cadence on piano followed by two consecutive pitches played by one of the seven instruments listed below. Then after a pause you will hear the note names of the two notes. This melodic series with different instruments is graduated in its level of difficulty. As the level gets more difficult, you will be asked to recognize and respond as both the cadence and the two notes are played more quickly. Below is the order of levels from the least difficult to most difficult. possibilities within two octaves both ascending and descending. Since these seven downloads get progressively harder it is recommended that you start with the Tenor Sax and work your way up to Acoustic Bass. If you prefer you can also download all 7 instruments as part of a 2 Note Melodic Bundle. The sound of an instrument can frequently affect a person’s ability to hear melodies within a key center. This is caused by our propensity to learn things contextually. In other words, when the instrument -or timbre- changes, our ability to identify pitches within a key center can also be affected. This will vary from one person to the next. Please use the examples found on this page to gauge if you need to work with these downloads. We recommend that you work with at least one instrument. These 2 Note Melodic Ear Training downloads do not contain a book. You should work first work with the”Ear Training One Note Complete Book” so that you can fully understand this ear training method before attempting the Two Note Series. You will use the same technique as you did with the Ear Training One Note as you identify the sound of each pitch within the key center. Tenor Sax is the first level of the Two Note Melodic Series containing 600 MP3s. There is no book available for the 2 Note Melodic Series. If you prefer a bundle of all seven instruments please see: Two Note Melodic Bundle. Tenor Sax being one of the most heard sounds in contemporary music is an important instrument to develop your recognition skills. These 600 MP3s cover all melodic possibilities within two octaves both ascending and descending. As the levels get more difficult the cadence is quicker and the two notes are played faster. Below is an example from Tenor Sax Two Note Melodic in a Major Key with Individual Instruments download. With each instrument you get progressively faster. Get Ear Training Two Note Melodic in a Major Key Tenor Sax download today! Jazz Guitar is the second level of the Two Note Melodic Series containing 600 MP3s. There is no book available for the 2 Note Melodic Series. If you prefer a bundle of all seven instruments please see: Two Note Melodic Bundle. Guitar is one of the most common instruments in the world. Developing your recognition skills with this instrument is crucial. These 600 MP3s cover all melodic possibilities within two octaves both ascending and descending. As the levels get more difficult the cadence is quicker and the two notes are played faster. Below is an example from Jazz Guitar Two Note Melodic in a Major Key with Individual Instruments download. With each instrument you get progressively faster. Get Ear Training Two Note Melodic in a Major Key Jazz Guitar download today! Alto Sax is the third level of the Two Note Melodic Series containing 600 MP3s. There is no book available for the 2 Note Melodic Series. If you prefer a bundle of all seven instruments please see: Two Note Melodic Bundle. Alto Sax along with Tenor Sax are one of the most heard sounds in contemporary music. It is an important instrument to develop your recognition skills. These 600 MP3s cover all melodic possibilities within two octaves both ascending and descending. As the levels get more difficult the cadence is quicker and the two notes are played faster. Below is an example from Alto Sax Two Note Melodic in a Major Key with Individual Instruments download. With each instrument you get progressively faster. Get Ear Training Two Note Melodic in a Major Key Alto Sax download today! Trombone is a crucial brass instrument in modern music. It is an important instrument to develop your recognition skills. These 420 MP3s cover the full range of the Trombone and all melodic possibilities within two octaves both ascending and descending. As the levels get more difficult the cadence is quicker and the two notes are played faster. Below is an example from Trombone Two Note Melodic in a Major Key with Individual Instruments download. With each instrument you get progressively faster. Get Ear Training Two Note Melodic in a Major Key Trombone download today! Trumpet is the fifth level of the Two Note Melodic Series containing 600 MP3s. There is no book available for the 2 Note Melodic Series. If you prefer a bundle of all seven instruments please see: Two Note Melodic Bundle. The Trumpet examples uses a two octave range. The Trumpet uses the bottom two octave range while the Muted Trumpet uses pitches from the lower 2 octaves of the Trumpet’s range. These 600 MP3s cover all melodic possibilities within two octaves both ascending and descending. As the levels get more difficult the cadence is quicker and the two notes are played faster. Below is an example from Trumpet Two Note Melodic in a Major Key with Individual Instruments download. With each instrument you get progressively faster. Get Ear Training Two Note Melodic in a Major Key Trumpet download today! The Muted Trumpet examples use the upper 2 octave range of the Trumpet. The Trumpet download used the bottom 2 octave range. These 600 MP3s cover all melodic possibilities within two octaves both ascending and descending. As the levels get more difficult the cadence is quicker and the two notes are played faster. Muted Trumpet being one of the most heard sounds in contemporary music is an important instrument to develop your recognition skills. These 600 MP3s cover all melodic possibilities within two octaves both ascending and descending. As the levels get more difficult the cadence is quicker and the two notes are played faster. Below is an example from Muted Trumpet Two Note Melodic in a Major Key with Individual Instruments download. With each instrument you get progressively faster. Ear Training Two Note Melodic in a Major Key Muted Trumpet download today! Bass lines have a crucial roll in most music and learning to hear them is important for any improvising musician. These 600 MP3s cover all melodic possibilities within two octaves both ascending and descending. The two notes are played at extremely fast pace and the answer is also given quickly. You will need to work with these files for awhile but they will raise your ability to instantly hear bass lines. Acoustic Bass being one of the most heard sounds in contemporary music is an important instrument to develop your recognition skills. These 600 MP3s cover all melodic possibilities within two octaves both ascending and descending. As the levels get more difficult the cadence is quicker and the two notes are played faster. Below is an example from Acoustic Bass Two Note Melodic in a Major Key with Individual Instruments download. With each instrument you get progressively faster. Get Ear Training Two Note Melodic in a Major Key Acoustic Bass download today! This entry was posted in Ear Training and tagged contextual ear training, Ear Training Two Note Melodic, Melodic dictation, key center based ear training by Muse Eek. Bookmark the permalink.